The 2015 San Francisco Giants season was the Giants' 133rd year in Major League Baseball, their 58th year in San Francisco since their move from New York following the 1957 season, and their 16th at AT&T Park. The team entered the season as the defending World Series champions and got second place in the NL West for the second straight year, but missed the playoffs with a record of 84-78 (.519). November 24, 2014 – Free agent IF Pablo Sandoval signs a five-year deal with the Boston Red Sox, bringing to an end Sandoval's decorated tenure with the Giants. December 4, 2014 – The Giants avoid arbitration with IF Travis Ishikawa and C Héctor Sánchez, agreeing to one-year deals worth $1.1 million and $800,000 respectively. December 19, 2014 – The Giants acquired IF Casey McGehee from the Miami Marlins in exchange for minor-league RHP's Kendry Flores and Luis Castillo. December 22, 2014 – The Giants re-sign free agent RHP Sergio Romo to a two-year deal worth $15 million. December 23, 2014 – Free agent RHP Jake Peavy re-signs with the Giants, agreeing to a two-year deal worth $24 million. Peavy receives full no-trade protection. January 16, 2015 – A couple of hours prior to the deadline for exchanging arbitration figures, the Giants agree to a one-year $2.1 million deal with RHP Yusmeiro Petit to avoid arbitration. January 19, 2015 – The Giants officially announce the signing of free-agent OF Nori Aoki to a one-year deal with an option for a second year. Aoki's deal is reportedly worth $4 million with another $1.5 million available in incentives. The option for the 2016 season is a team option worth $5.5 million with a $700,000 buyout, that becomes a mutual option if Aoki reaches 550 plate appearances. January 22, 2015 – Despite arbitration figures being submitted, the Giants agree to a two-year deal with OF Gregor Blanco to avoid the process. Blanco's deal is reportedly worth $3.6 million in the first year, and $3.9 million in the second. January 23, 2015 – The Giants re-sign RHP Ryan Vogelsong to a one-year deal reported to be worth $4 million plus performance bonuses. January 27, 2015 – The Giants avoid arbitration with IF Brandon Crawford agreeing to a one-year deal worth $3.175 million, reportedly the midpoint between the two sides arbitration figure submissions. February 2, 2015 – The Giants agree to a one-year contract with IF Brandon Belt, the deal is reportedly worth $3.6 million. The midpoint between the two sides arbitration submissions was $3.75 million. February 12, 2015 – The Giants agree to a one-year contract with IF Casey McGehee, the deal is reportedly worth $4.8 million. The midpoint between the two sides arbitration submissions was $4.7 million. March 5, 2015 – OF Hunter Pence breaks his arm when hit by a pitch during a spring-training game at Scottsdale Stadium. March 31, 2015 – The Giants designate 2010 first-round pick OF Gary Brown for assignment in order to make room for non-roster invitee OF Justin Maxwell. Maxwell, a Giants fan growing up, was told he would make the Giants opening day roster. April 3, 2015 – Bruce Bochy and Brian Sabean agree to contract extensions with the Giants through at least the 2019 season. Sabean is promoted to Vice-President of Baseball Operations, while Bobby Evans is promoted to General Manager. April 5, 2015 – The Giants opening day roster is announced with the Giants naming 13 pitchers, and choosing IF Matt Duffy over IF Ehíré Adríanza for the final bench spot. OF Hunter Pence and IF Travis Ishikawa will begin the season on the disabled list. April 7, 2015 – The day after the Giants open the season with a win against the Arizona Diamondbacks, with RHP Jake Peavy having already been scheduled to miss his first start of the year, RHP Matt Cain is placed on the 15-day disabled list with a flexor tendon strain. The Giants call up RHP Chris Heston to take Cain's place in the rotation. 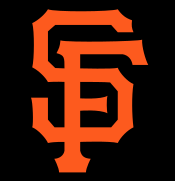 April 18, 2015 – The Giants lose another starting pitcher when RHP Jake Peavy is placed on the disabled list with a back strain, moving RHP Ryan Vogelsong back from the bullpen into the rotation. May 16, 2015 – OF Hunter Pence is activated from the disabled list, doubling in his first at-bat and scoring three runs in the game. May 21, 2015 – The Giants complete a three-game shutout sweep of the Los Angeles Dodgers at AT&T Park, a feat they last managed June 25–27, 2012. June 8, 2015 – The 2015 Major League Baseball draft takes place with the Giants selecting RHP Phil Bickford with the 18th overall pick. June 9, 2015 – RHP Chris Heston pitches the 17th no-hitter in Giants history against the New York Mets, making 110 pitches, striking out 11 including three called strikeouts in the 9th inning, with the only baserunners being 3 hit batsmen. Heston also had two hits and drove in two runs in the game. The no-hitter was the third by a Giants rookie and the first by a visiting pitcher at Citi Field. The Giants became the second team in history to throw no-hitters in four consecutive seasons, following the 1962-65 Los Angeles Dodgers. June 12, 2015 – OF Hunter Pence returns to the disabled list with tendinitis in his left wrist. June 20, 2015 – OF Nori Aoki is hit by a pitch from Dodgers RHP Carlos Frías. After initially being diagnosed with a contusion, a second X-ray revealed that Aoki had fractured his right fibula and would have to spend two weeks with his leg in a cast before being re-evaluated. Aoki was placed on the 15-day disabled list. July 2, 2015 – The Giants sign Bahamian IF Lucius Fox with a signing bonus of $6 million. Fox ranked 3rd on MLB.com's top 30 international prospects. July 3, 2015 – RHP Matt Cain and RHP Jake Peavy return from the disabled list, losing two games of an 0-6 road-trip for the Giants. RHPs Tim Lincecum and Tim Hudson are placed on the disabled list in their places. July 6, 2015 – The rosters for the 2015 Major League Baseball All-Star Game are announced, with C Buster Posey being named the National League's starter at catcher and to the all-star game for the third time. LHP Madison Bumgarner is named to his third all-star roster, IF Joe Panik and IF Brandon Crawford make the all-star game for the first time. July 7, 2015 – OF Hunter Pence comes off the disabled list helping the Giants to snap a 7-game losing streak, and to a sweep of the Philadelphia Phillies to leave their record at 46–43 at the All-star break. July 30, 2015 – The Giants trade two minor leaguers; IF Adam Duvall and RHP Keury Mella to the Cincinnati Reds in exchange for RHP Mike Leake. August 20, 2015 – On a day when two of the Giants starting outfielders were on the disabled list, the Giants acquire OF Marlon Byrd and cash d from the Cincinnati Reds in exchange for minor league RHP Stephen Johnson. August 31, 2015 – The Giants acquire OF Alejandro De Aza and cash from the Boston Red Sox in exchange for minor league LHP Luis Ysla. All schedule and scores taken from MLB.com. ^ Browne, Ian. "Red Sox score big, land Panda and Hanley". MLB.com. Retrieved December 24, 2014. ^ Gitlin, Marty. "Report: Giants sign 1B Travis Ishikawa to one-year deal". CBSSports.com. Retrieved December 24, 2014. ^ Hurcomb, Michael. "Giants avoid arbitration with catcher Hector Sanchez". CBSSports.com. Retrieved December 24, 2014. ^ Haft, Chris. "Giants acquire McGehee to fill third-base spot". MLB.com. Retrieved December 20, 2014. ^ Haft, Chris. "Romo signs 2-year contract to stay with Giants". MLB.com. Retrieved December 23, 2014. ^ Nowak, Joey. "Giants, Peavy finalize 2-year contract". MLB.com. Retrieved December 24, 2014. ^ Mello, Igor. "Giants, Yusmeiro Petit avoid arbitrtion". cbssports.com. Retrieved January 16, 2015. ^ Collier, Jamal. "Giants sign outfielder Aoki to one-year deal". MLB.com. Retrieved January 20, 2015. ^ Kruth, Cash. "Giants reportedly ink Blanco to two-year deal". MLB.com. Retrieved January 19, 2015. ^ Haft, Chris. "Giants bring back Vogelsong on one-year deal". MLB.com. Retrieved January 23, 2015. ^ Berry, Adam. "Source: Arbitration-eligible Crawford gets $3.175 million". MLB.com. Retrieved January 27, 2015. ^ Nowak, Joey. "Giants, Belt reportedly avoid arbitration with 1-year deal". MLB.com. Retrieved February 2, 2015. ^ Haft, Chris. "Giants reach one-year deal with McGehee". MLB.com. Retrieved February 13, 2015. ^ Kharl, Christina. "Hunter Pence to miss 6–8 weeks". ESPN.com. Retrieved March 6, 2015. ^ Schulman, Henry. "GIANTS SPLASH: Justin Maxwell makes team, Gary Brown designated". sfgate.com. Retrieved March 31, 2015. ^ Thornburg, Chad. "Bochy, Sabean agree to contract extensions". MLB.com. Retrieved April 3, 2015. ^ White, R.J. "Giants keep Machi, Kontos, Duffy on Opening Day roster". cbssports.com. Retrieved April 5, 2015. ^ Schulman, Henry. "GIANTS SPLASH: More on Matt Cain's injury and prognosis; Correia signed". sfgate.com. Retrieved April 7, 2015. ^ Haft, Chris. "Back strain lands Peavy on disabled list". mlb.com. Retrieved June 12, 2015. ^ Call, Andy. "'Extremely strong' Pence debuts with two hits". mlb.com. Retrieved May 22, 2015. ^ Gurnick, Ken. "Double-threat MadBum, Giants sweep Dodgers". mlb.com. Retrieved May 22, 2015. ^ Haft, Chris. "Giants go with college pitcher in 1st round". mlb.com. Retrieved June 8, 2015. ^ Collier, Jamal. "Giants rookie Heston twirls no-hitter vs. Mets". mlb.com. Retrieved June 9, 2015. ^ Haft, Chris. "Giants place Pence on DL, recall Broadway". mlb.com. Retrieved June 12, 2015. ^ Macklin, Oliver. "X-ray discovers fracture in Aoki's leg". mlb.com. Retrieved June 25, 2015. ^ Haft, Chris. "Giants sign infielder Fox as int'l free agent". mlb.com. Retrieved July 7, 2015. ^ Haft, Chris. "Giants swept by Marlins in Cain's debut". mlb.com. Retrieved July 7, 2015. ^ Haft, Chris. "Homer the only blemish as Peavy loses return". mlb.com. Retrieved July 7, 2015. ^ Haft, Chris. "MadBum, Crawford, Panik named All-Stars". mlb.com. Retrieved July 7, 2015. ^ Macklin, Oliver. "Pence energizes Giants with dazzling play". mlb.com. Retrieved July 16, 2015. ^ Laymance, Austin. "Giants acquire righty Leake from Reds". MLB.com. Retrieved July 31, 2015. ^ Cassavell, AJ. "Giants acquire Byrd from Reds for Minors arm". MLB.com. Retrieved August 20, 2015. ^ Half, Chis. "Giants add lefty-hitting outfielder De Aza". MLB.com. Retrieved August 31, 2015. ^ "San Francisco Giants Schedule". MLB Advanced Media, L.P. Retrieved December 20, 2014. Wikimedia Commons has media related to 2015 San Francisco Giants season. This page was last edited on 21 January 2019, at 17:41 (UTC).